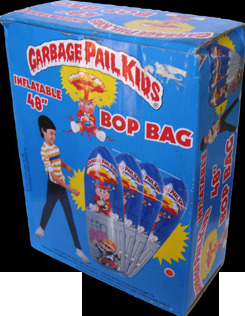 One of the toughest Imperial Toy items to come by is the Bop Bag. 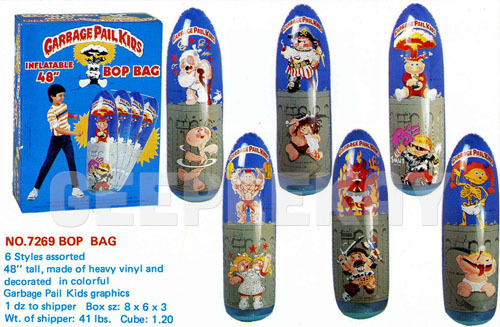 These 48" inflatable vinyl bags were released in 1986 as part of Imperial Toys massive GPK-themed toyline. The bags inflated to show one of 6 different 1st or 2nd series characters 'coming out' of a grey trash can. The bottom of the bag is weighted so it would bounce back when you punch it. The box features the complete set on the front, and the character inside the box on the back. As I stated before, these are some of the hardest items to locate - and are rarely seen in this condition. I am proud to have the Adam Bomb Bop Bag as part of my collection. The artwork on the Imperial Toy Bop Bags is rarely seen as most collectors tend to keep theirs deflated and folded up in the boxes. Thankfully, LuCypher was kind enough to blow up a couple of his and snap a picture. 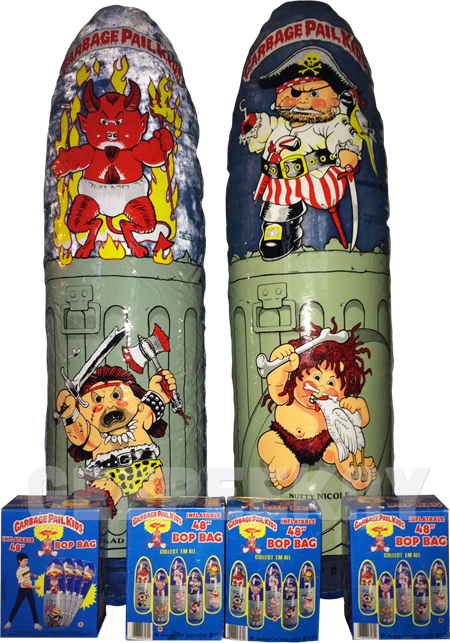 Below you will see not only how tall these were when inflated, but also the fantastic artwork that was created for these toys! Included in each Bop Bag box were TWO repair kits. 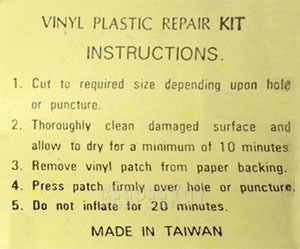 These kits included small pieces of vinyl and a small sheet of yellow paper containing instructions on how to repair the bop bags. 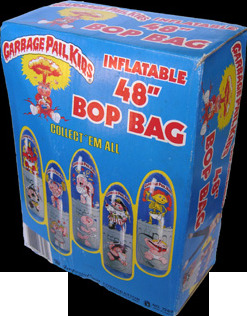 Below is an image of the instructions included with each Bop Bag. It is clear these were not specific to Garbage Pail Kids, rather they were thrown in every type of Bop Bag manufactured by Imperial Toy Company. 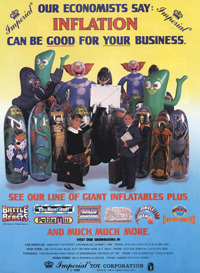 I also have in my collection an extremely rare magazine advertisement for the Imperial Toy Bop Bags. Also on the ad is the logo for numerous products featured on the bags (Battle Beasts, etc). 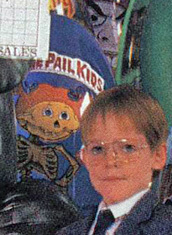 Garbage Pail Kids apparently weren't enough of a draw to have their logo featured, however if you look closely over the boys right shoulder, you will see the Bony Joanie Bop Bag! This is an extremely rare piece of GPK Memorabilia and I'm proud to have it in my collection.